Students on Academic Alert or Academic Probation can, and often do, improve their Academic Standing during the next semester. To facilitate improvement, students in the Probation Process are required to meet with a UCA Peer Coach to review challenges faced in previous semesters and develop a plan for improvement. Students on Probation are required to complete both an initial coaching session, and a follow-up session. An alert or probation hold is placed on student accounts until this requirement is met. The holds prevent advance registration. If you’re on Academic Alert or Academic Probation, you will be contacted about the University’s Probation Process, and how we can work together to find ways to improve your academic standing. One of the requirements of the program is that you meet with your UCA Peer Coach. Our coaches are available to help you identify challenges you’ve had in past semesters, and find ways to improve your academic standing. 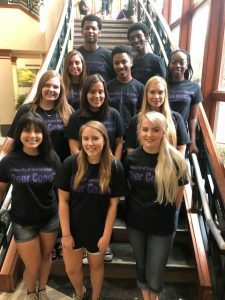 Peer Coaches are UCA students who have had training in time management skills, study methods, note-taking skills, and test-taking strategies. They’re also familiar with the academic policies concerning probation and suspension, as well as the support services and resources you may need to improve your academic standing. Finally, our coaches are supportive and approachable, and they want to help. All students on Academic Probation must meet with a Peer Coach twice prior to registration for the following fall or spring semester. Meeting early in the term can help you avoid another semester of low academic achievement. You should receive an email from your peer coach sent to your UCA email account that introduces him or her, and tells you how to make an appointment by following the link in the email or going to myUCA, GradesFirst, “Get Tutoring or Coaching,” “Success Coaching,” and selecting your coach. If you have difficulty in scheduling an appointment, email your coach or contact the Office of Student Success at studentsuccess@uca.edu for assistance. Be sure you download the Self-Assessment form, COMPLETE it, and bring a copy with you to your session. Students on Academic Alert are required to meet at least once with a Peer Coach prior to registration for the following fall or spring semester. Meeting early in the term can help you avoid another semester of low academic achievement. You should receive an email from your assigned peer coach sent to your UCA email account that introduces him or her, and tells you how to make an appointment by following the link in the email or going to myUCA, GradesFirst, “Get Tutoring or Coaching,” Success Coaching,” and selecting your coach. Walk-in hours are also available in first-year residence halls and through the Office of Student Success, but appointments are strongly encouraged. Please see the Office of Student Success website for hours.